If you have multiple devices, some from Apple, some newer Android phones, and some older microUSB gadgets, you likely also have a messy cable situation with three or more cables lying around, waiting to serve their duty to charge up various electronics. 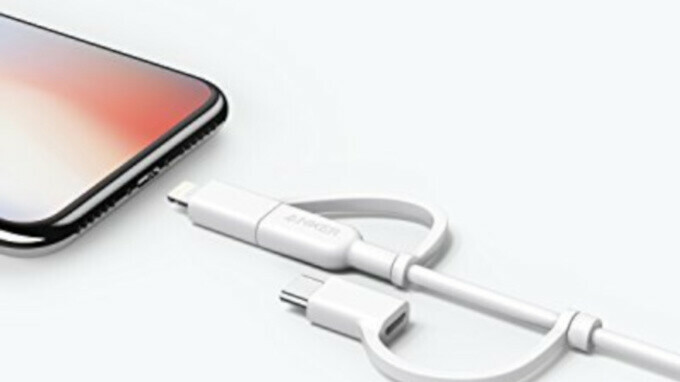 Well, you no longer need to deal with all that mess as Anker has introduced a new PowerLine II 3-in-1 cable that supports microUSB, Apple Lightning and USB-C standards. The Lightning cable in particular is MFi certified, so you can rest assured that it will not damage the battery on your iOS device. Plus, this being an Anker Powerline cable, it is also extremely durable, so much so that Anker is providing a lifetime, hassle-free warranty. To put its durability into context, let's say that it is designed to withstand being bent 12,000 times and is officially said to be up to 12 times more durable than conventional cables. The cable supports up to 2.4 amp speeds on the microUSB and Lightning sides, and up to 3 amps on the USB-C side. Dongle life. Not having any of it. I just wish the the usb c and lightning parts clipped onto the sides of the main micro is part so to not have loose pieces.